Global consciousness of an indispensable mutation to an energy-sober world is working. Increasing scarcity of natural resources, added to environmental and climate urgencies, will lead us in the next years to drastically change our habits for all aspects of our lives. Our leisure activities will not be spared: these ones shall be (as paddling and sailing) energy-thrifty; in addition, due to carbon tax, we will also have to reduce expensive moving related to our hobbies’ practice. A solution to continue frequently having fun on water is in varying pleasures, when practising a ‘local’ navigation. 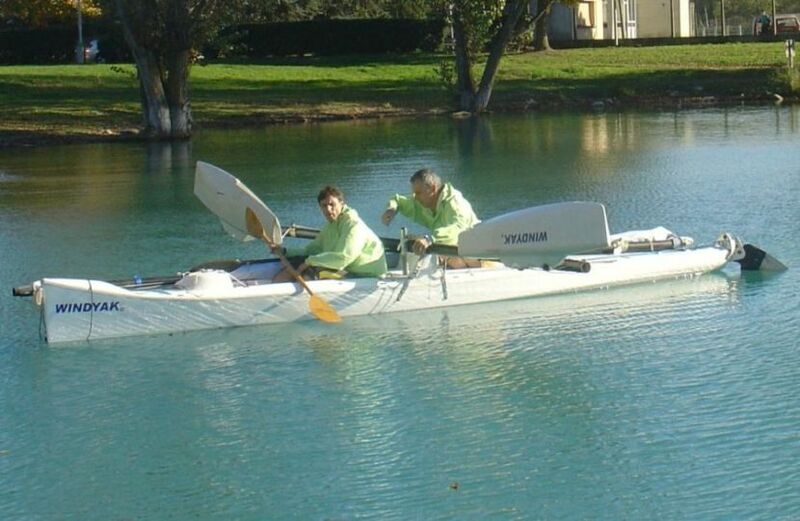 Kayak is and will stay an incomparable tool to access any stretch of water, close to your home. Using it also , depending on weather conditions, to practice sailing, will deeply transform your perception of your local navigation sites’ possibilities. We work on WINDYAK, a modular concept of sailing trimaran foldable to a kayak during navigation, designed to offer 100% of all sailing trimaran and kayak uses. It brings some true innovations (float articulation and sail furling) for an easy and quick transforming on water. It so combines, thanks to lightness and an entirely specific design, both speed sensation of a multihull and easiness of a kayak. The boat can be carried on a car roof, and is very quickly mounted without any tool. She can be sailed single or double handed, on sea and lakes, but as a kayak, she also allows discovering unusual waters out of reach of other sailing crafts, like rias, rivers and canals. 4 knots when paddling… and much more when sailing ! WINDYAK concept is being extended to different sizes between 4.2m and 5.9m. 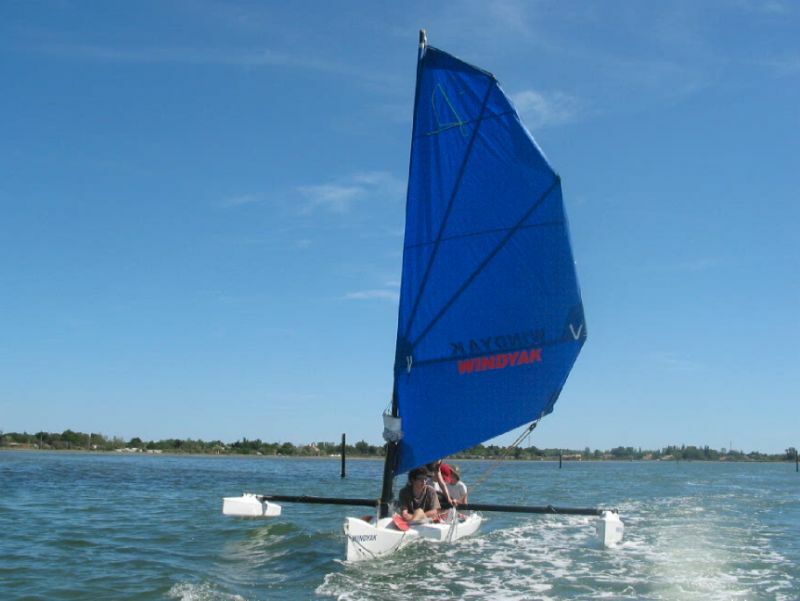 It has also been adapted to existing sea kayaks: This consists in a removable kit allowing to unfold during navigation to a sailing trimaran configuration. As in essence a low-environmental-impact concept, WINDYAK has been awarded End 2007 as one of the 3 finalist of the Bateau bleu competition from F.I.N. (Nautical Industry French Federation), which topic was ‘Eco-design for pleasure boat or for its equipments’. Download below the report (in French) written for the competititon to assess the specific advantage of WINDYAK in this matter. WINDYAK abolishes the border between two complementary practices. Welcome to the 21th century light sailing and boating ! Are you a professional from nautical industry ?We are looking for industrial partners to build and sale the different WINDYAK products. 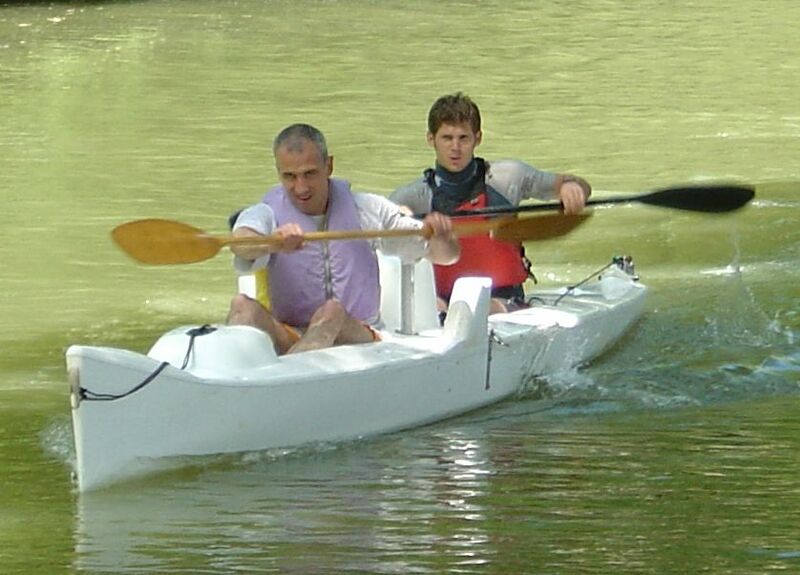 The market research performed during the last La Rochelle boat show in September 2006 confirms public desire for sailing-paddling hybrid concept. Contact us to know more ! Are you a potential user interested by proposed concept ? Please don’t hesitate to send an e-mail at windyak@free.fr to give us your comments; tell us which product you are interested in and we will regularly inform you about the progress of the project. You can also download the summary PDF files for the project.